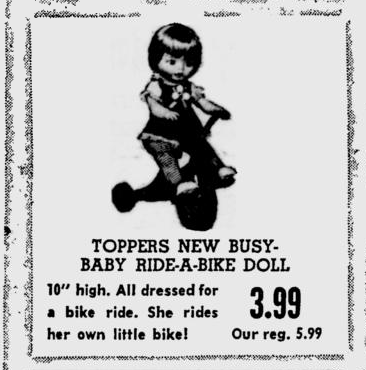 This doll (Busy-Baby Ride-a-Bike) was released in two varieties; with and without batteries. 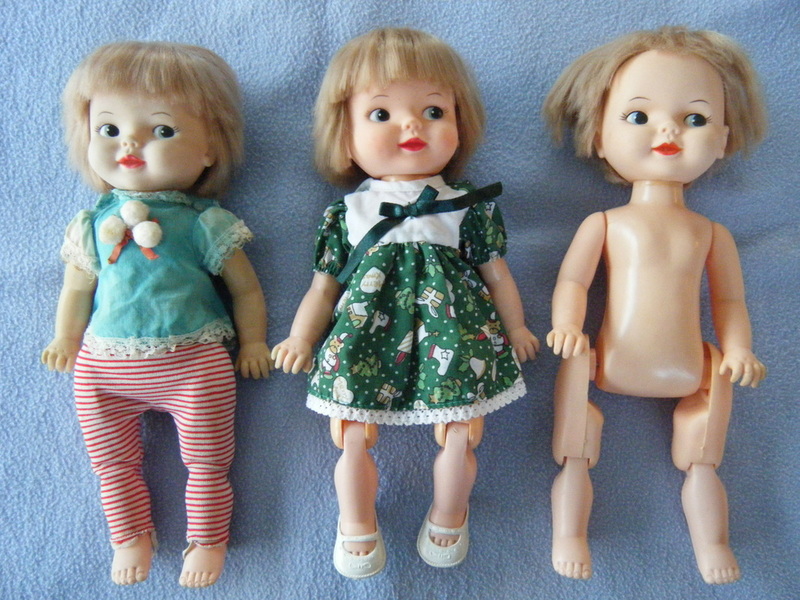 This page focuses on the battery operated doll. It uses a single "C" battery. Information on the recently obtained tricycle can be found here. Bikey was marketed by Deluxe Reading, which is also Pedigree. My sister was so intrigued with the multiple Bikey mystery and the non-locatable bike/trike, that she purchased two of the battery powered Bikeys on eBay. She now has a total of 3. I've taken a group photo of the Bikey sisters and undertaken the repair of the two non-operational battery powered Bikeys. The Bikey sisters. The left Bikey is battery powered and in original clothing (but no shoes). The middle Bikey is battery powered with non-original clothes but original shoes. The undressed Bikey is not battery powered. 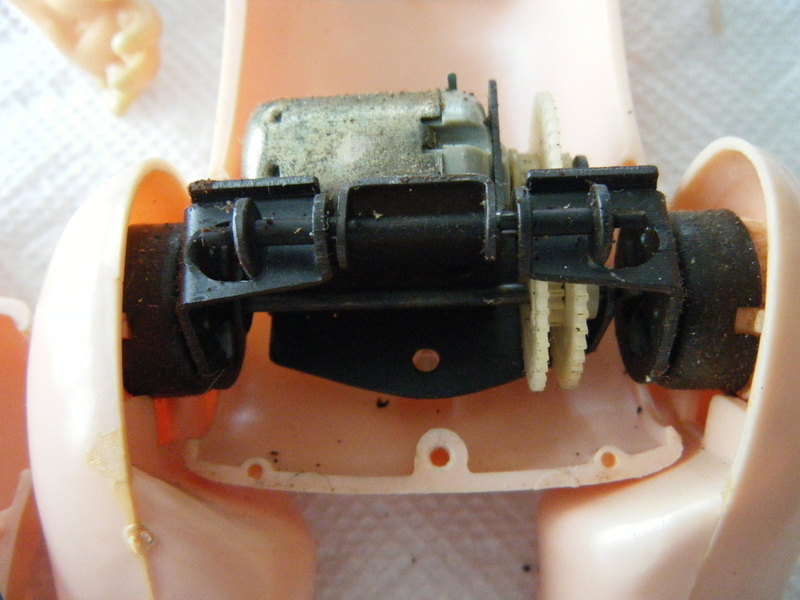 Opening the battery compartments revealed a nightmare of battery corrosion in both dolls. 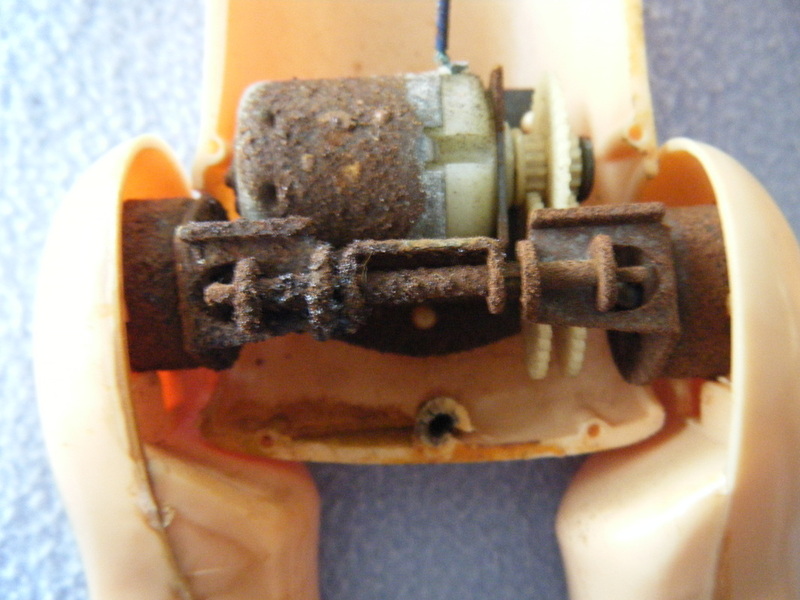 Not only had the lower battery contact corroded off but the battery acid had seeped into the motor compartment in the doll's rear end. One of the nifty features of the Bikeys are their switches. The back of the neck is embossed with ON and OFF. The beveled lever at the top of the battery compartment exposes or covers the battery terminal as the lever is rotated left or right. 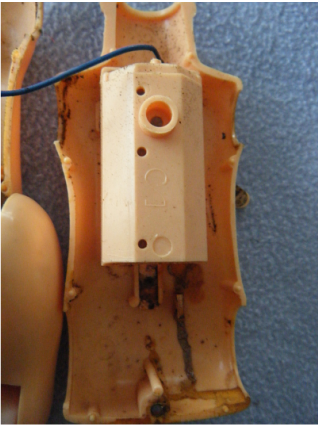 This means the lower contact must also act as a spring forcing the battery upward. 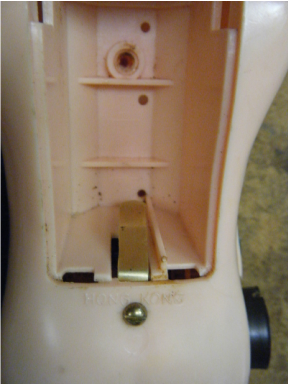 The hole below HONG KONG is not for wetting - it is a rivet hole for the contact (visible as the loose piece in the back of the battery compartment. This is the motor compartment of the more damaged Bikey. All the finish is corroded off the motor and the mechanical linkages. Everything is seized up with rust. When I found this, I decided that I would open the other Bikey to see if it was in better shape (see photo to the right). Once again I made use of my father's clock repair tools and supplies. He had some sheet brass and a miniature brass screw and nut. Using his shears and specialty pliers I was able to fabricate and attach a new contact. I retinned and attached the blue wire to the motor terminal. Close-up of the new brass contact from the battery compartment side. I had to adjust the contact so that it would maintain upward pressure on the battery during the switching process. I couldn't rivet the new contact into position, so I used a brass screw instead. A small cosmetic price to pay to restore the doll to operation. The dye in the pants interacted with the hard plastic of the upper leg but not the softer plastic of the lower leg creating a zebra effect. The Bikey sisters from the back. It is interesting to see how the hair has survived or not survived over the years. 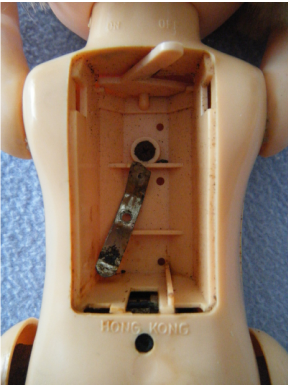 This is the inside of the belly half of the doll's body. 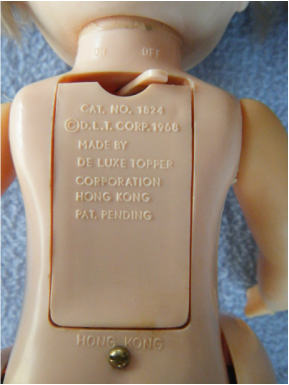 The doll's head has to be removed before the body could be taken apart. Fortunately, the body is screwed closed and not glued. Unfortunately, the battery acid corroded the screw which damaged the threaded plastic post when the screw was extracted. 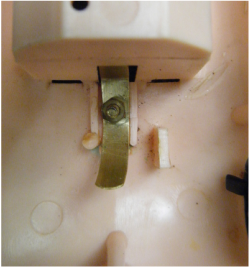 The blue wire coming from the top of the doll normally connects the upper battery terminal to a tab on the motor. The solder joint at the motor had broken free - probably another side effect of leaking battery acid. The trough below the battery housing is where the battery contact (if intact) would project into the motor compartment and complete the circuit by pressing up against the motor's metal casing. The motor compartment of the less damaged Bikey. Corrosion damage was minimal but both battery connections were gone. I jumpered a battery to the motor but it wouldn't turn over without lubricating the system with clock oil and hand turning the gears through a few dozen revolutions. This Bikey could be saved if I rebuilt the electrical connections! This is a close-up of one end of the new contact. 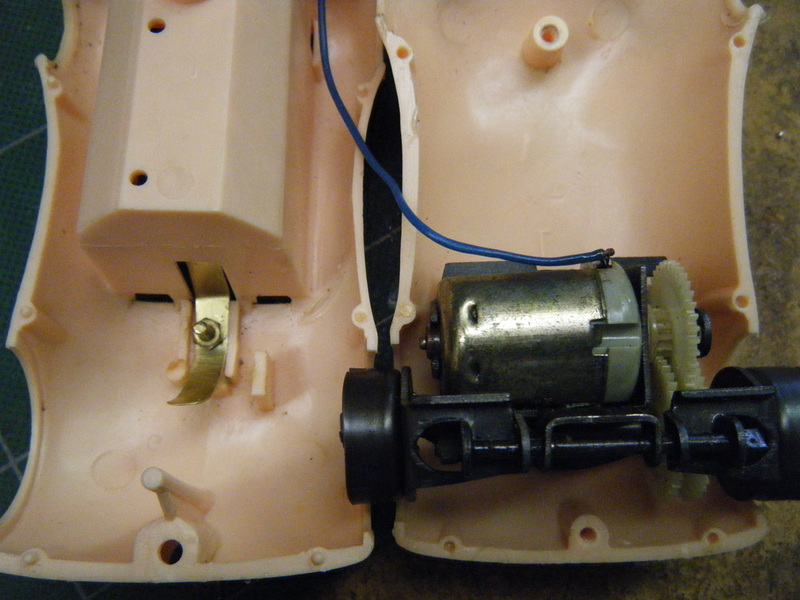 The curved portion has to snug up to the motor housing when the doll is assembled so that the electrical circuit is complete. Good thing the battery compartment door was large enough to fit all the fine print. 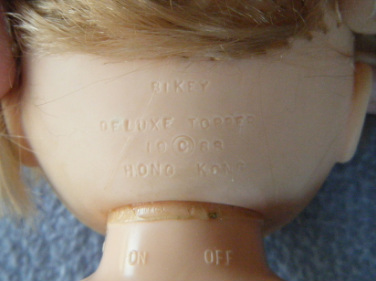 The doll mark is why we named the doll "Bikey" This is how it is commonly identified on eBay. The stuff around the neck is glue. The doll's head was glued on. There does not seem to have been a good reason to do this because the head popped on over a flange. You would have thought the doll would have been more versatile if she could look around when put in various poses. Since I was able to get one Bikey to work, I decided to go for the second as well. Admittedly, it was going to be a looooong shot. I started by scraping off as much rust and corrosion as possible using X-acto blades and emery paper. Even a few drops of clock oil on the moving parts and motor axle could not make the mechanism work. I decided to strip down the motor and clean the corrosion out of its interior. I had to dismantle the slot and tab mounting system first. It was worth it as I was able to get the motor running as a stand alone entity. 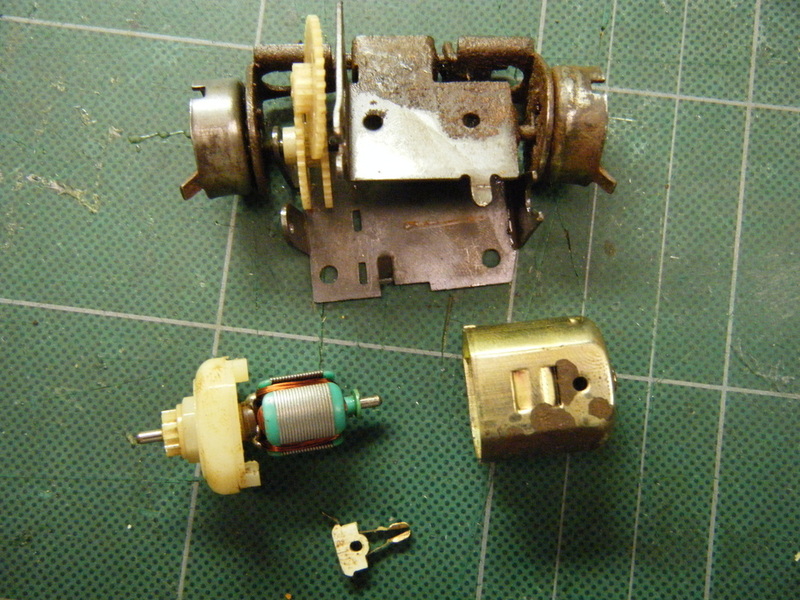 Getting the motor running was one thing - getting the mechanism to work again was another. I had to disassemble the spring loaded hip joints and burnish all the surfaces. 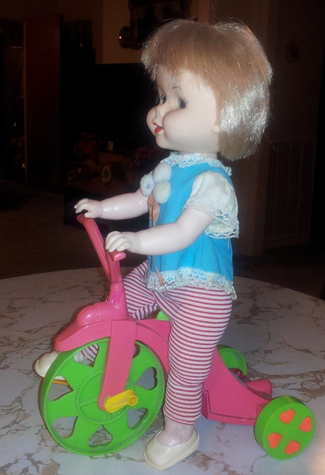 (The hips are spring loaded so that the doll's legs can be posed when she is not riding her vehicle.) I was amazed when the reassembled mechanism actually worked! However, there are still some problems to be overcome. The battery acid pitted the bearing surfaces so badly that the mechanism hangs up sporadically. It is likely that the surfaces will corrode again as they no longer have any sort of protective finish on them. New battery contacts will have to be fabricated as well. After weeks of searching for any information on Bikey's mode of transportation, we finally hit pay dirt the morning after the Bikey rebuilds! Someone posted a Bikey and her tricycle on eBay! The pictures below are screenshots taken from the eBay posting. The tricycle is missing a pedal and the rear wheels reportedly fall off. Unfortunately, there are no pictures of the back of the tricycle to see what it looks like. It does appear that the tricycle just moves in a straight line. Bikey's stirrup straps keep her feet on the pedals. Here is an ad that ran in a newspaper in October of 1969.